An anonymous blogger critical of Pennsylvania Attorney General Tom Corbett plans to challenge a grand jury subpoena ordering Twitter to reveal the blogger’s identity. “It doesn’t really matter why we are criticizing him,” said ”Signor Ferrari,” one of the two Twitter users targeted in the subpoena from Corbett, who won the Republican gubernatorial primary Tuesday. ”It’s our First Amendment right to criticize him no matter who we are,” said Signor Ferrar said in a telephone interview Wednesday. He uses that pen name on the CasablancaPA blog. 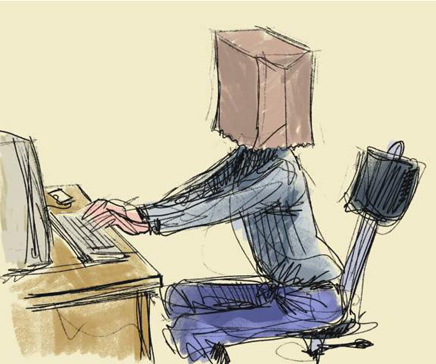 The subpoena follows a string of similar efforts to unmask anonymous writers, with mixed results. A Louisiana politician dropped a defamation suit Tuesday against 11 anonymous commenters on The Times-Picayune website after the outlet refused to release their identities. In August, however, Google unmasked the operator of the “Skanks in NYC” blog after being subpoenaed by an Australian model who claimed the site defamed her. And on Monday, a federal judge prevented Yahoo from revealing the identity of a message-board poster critical of USA Technologies. While those efforts involved civil subpoenas, Corbett is apparently treating his online critics as potential criminals, using his power as the state’s top law enforcement official to issue a grand jury subpoena. The subpoena does not state what kind of crime the grand jury is investigating. The subpoena to Twitter was dated May 6 and required Twitter to respond by May 14 with all identifying information it has on the Twitter accounts of bfbarbie andCasablancaPA, which is also Signor Ferrari’s handle on Twitter. The deadline had been extended, Signor Ferrari said. The account @CasaBlancaPA, whose owner is identified as ‘Signor Ferrari’ (a criminal in the film Casablanca, played by Sydney Greenstreet) on Twitter, links to this blog in the bio section. The blog, hosted on Google’s Blogger service, is dedicated to “exposing the hypocrisy of Tom Corbett” according to its subtitle. In 2008, a lawsuit was filed by a former state employee against the Pennsylvania Attorney General’s office that alleges public dollars were “illegally paid out to vendors” and contends wrongful termination. However, there have been no charges filed or evidence of criminal wrongdoing by Corbett. We’re digging further into this. We believe this is more about the blog than the Tweets. We have not received notification of a subpoena to Blogger, so we really don’t know. We are seeking legal representation and plan to ask Twitter not to comply. Although the subpoena was to appear last week, we believe Twitter asked for additional time because we received notification last night. We believe in the constitutionally-protected right of Americans to criticize public officials anonymously. We protect and do not disclose user information except in limited circumstances. We notify a user, if we believe we are allowed to by law, when we receive any request for their information that we may be required to comply with. This policy is designed for maximum transparency and gives users an opportunity to object. Even if Tom Corbett has the legal authority to do this, which is open to debate, it doesn’t seem as though it could possibly be a good idea. Whoever is behind the two accounts criticizing him, they have fairly tiny followings — which is likely to change now that they’re the subject of the wrath of the Attorney General’s office. It’s a classic case of Streisand Effect, and it’s all the more a head-scratcher for the relative tameness of the Tweets in question: You could do a lot worse in most corners of the political blogosphere. The striking thing is that this is a subpoena to provide evidence in a criminal investigation. If it had been a subpoena related to a civil libel lawsuit, then either Twitter or the anonymous poster could try to quash the subpoena, and then the court would have to decide whether the plaintiff had, at least, a legally sufficient libel case (i.e., the statements were factual allegations and not opinions, and there was some reason to think the factual allegations were false). If the plaintiff did have such a case, then the plaintiff would indeed be able to discover the identity of the defendant, so he could know whom to sue, and so he could get further factual information relevant to the case (such as what the defendant knew about whether the statements were true or false). That’s the emerging rule in many states (though there are important variations in detail). There are no Pennsylvania appellate cases on the subject, but I expect that Pennsylvania courts will follow this rule, as several Pennsylvania trial courts in fact have. But this is a grand jury subpoena, so presumably the theory is that the subpoenas are relevant to some criminal investigation. My sense is that one should be able to quash such a subpoena as well, if there is no legally sufficient basis for the investigation, or for the conclusion that the information would be relevant to the investigation. Yet that requires us to know what is being investigated. It can’t be an investigation of libel, since Pennsylvania doesn’t have a criminal libel statute. In principle, since some tweets from the relevant twitterers might be read as accusing Corbett of criminal misconduct, the twitterers’ identities might be relevant so they could be asked for further evidence of such misconduct. But I have no reason to think that Corbett is indeed being so investigated. So this looks like an interesting case; I hope Twitter does move to quash the subpoena, so we can get some better sense of whether the subpoena indeed has a legal basis. And if you have any further information you can share about the underlying investigation, please let me know. Thanks Steve Piercy for the pointer. Corbett’s office hasn’t yet responded to inquires from TechCrunch or Smith to explain why on earth he’d subpoena Twitter to unearth the identity of his anonymous critics. Corbett will face Democratic nominee Dan Onorato, the chief executive of Allegheny County. Corbett, the Republican candidate for governor, was seeking to unmask the account holders ahead of Friday’s sentencing of Brett Cott, whom Corbett targeted in a political corruption investigation.